Open Monday to Sunday from 10.00 to 18.00. Open Thursdays from 10.00 to 20.00. Before midday or after 15.00. The museum will be busier on weekends and national holidays. We are comparing Pergamon Museum Skip the Line Ticket Prices from leading ticket suppliers and Try to find you Cheap tickets prices on the market. The Pergamon Museum hosts one of the greatest collection of Eastern artefacts in Europe. Items on display inside the museum have been gathered from Egypt, Iran, the Caucasus and the Asian Minor and carefully put together to form brilliant cultural exhibitions. This part of the Pergamon museum showcases over 270,000 artefacts from ancient civilisations like the Anatolia (modern day Turkey), Assyria and Mesopotamia. It is in this part of Berlin’s Pergamon Museum that you will find the Procession Way of Babylon and the eye-catching Ishtar Gate. Here you can find the Market Gate of Miletus, dating back to 100 AD. Both civilisations were pretty handy with the hammer and within the Antiquity Collection you’ll see some of their best creations. Among the 8th to 19th century masterpiece you can find the beautiful facade of the Mshatta Palace. The museum hosts a collection of Jewish, Christian and Muslim art as well as architectural works such as the Aleppo Room. Right for people with a spark for ancient and medieval history. A must for art enthusiasts and international travellers who will get to see one of the best collections of international art in Europe. Your Experience With Pergamon Museum Skip the Line Ticket? Travel around the world and through the centuries on a self-guided visit to the Pergamon Museum. Discover the highlight of Berlin’s Museum Island. Use your free audio guide to learn about the hundreds of intriguing artefacts that the museum hosts. Take advantage of your fast track entry ticket to skip to the front of the queue and start exploring inside. Compare Roman Art to Islamic Art, Arabic Art and Ancient Greek Art. See one of the original Seven Wonders of the World, the Ishtar Gate, and marvel at fantastic collections of architecture, art, religious artefacts and ornaments. Soak in the majesty of the Mshatta Palace’s stone façade. What Pergamon Museum Skip the Line Ticket Includes? Admission to the Pergamon Museum. Audio guide (available in 13 languages. The Possessional Way to the Ishtar Gate of Babylon. Roman Market Gate of Miletus. Large bags, including backpacks, are not permitted inside the museum therefore we recommend travelling light to avoid delays at the entrance. The Pergamon is a large museum with a lot of artefacts inside. We recommend putting aside a minimum of 2 hours to explore the museum complex. 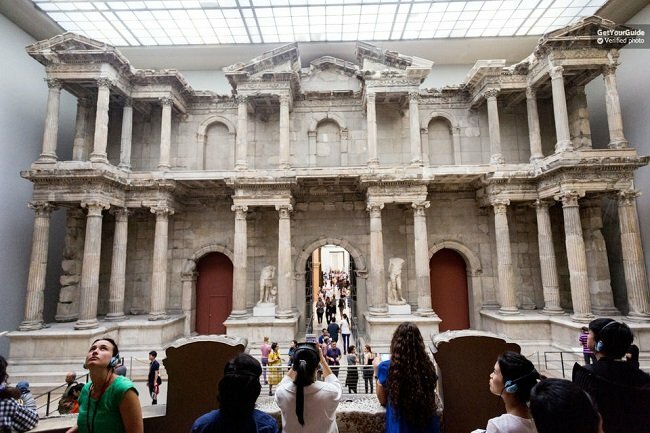 Travelers Reviews about Pergamon Museum Skip the Line Ticket? The Pergamon Museum has been rated as a 4.8 out of 5-star attraction by over 1,000 visitors on Get Your Guide. The attractions also has an average 4.5 out 5-satr rating from over 17,000 Trip Advisor users. Travellers point out that skip the line entry can save you over an hour wait at the entrance. People who have visited the museum have left very positive feedback. In general they agree that the museum hosts exceptional examples of art and artefacts from past civilisations. Comments have also complimented the museums Islamic art collections. Only part of the museum is wheelchair accessible. Please bring your printed or mobile ticket to the entrance. Tickets for the Pergamon Museum are non-refundable. Your complimentary audio guide is available in English, Dutch, German, French, Spanish, Italian, Greek, Polish, Russian, Turkish, Chinese and Japanese. The North Wing (including the Pergamon Altar) will be closed until 2023 for refurbishment. Your skip the line ticket is only valid for your selected 30-minute period. If you arrive late then you may be denied entry and a refund will not be issued. Children (under the age of 18) can enter for free and do not require a reservation is accompanying an adult with a fast track ticket. Meeting Point: please go directly to the fast track line at the entrance to the Pergamon Museum. Pergamon Museum Visitors' entrance, Bodestrasse 10178 Berlin.